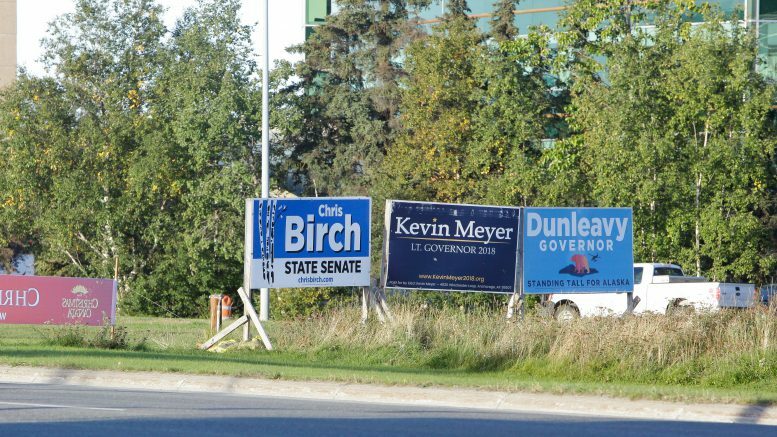 An Anchorage Superior Court judge today approved a partial deal between the Alaska Department of Transportation and the ACLU of Alaska in a lawsuit challenging the constitutionality of a voter-approved ban on political signs posted along state roads. Those “small” signs can be up to 4-by-8-feet, which are typically the largest signs produced by campaigns and are one of the main products of ACLU of Alaska’s partner in the lawsuit, Dunleavy for Alaska. Dunleavy for Alaska is the independent expenditure group largely bankrolled by the brother of Republican gubernatorial candidate Mike Dunleavy. The state has laws on the books that prohibit all types of outdoor advertising within 660-feet or viewable from state roadways regardless of whether they’re on private property or not. The law contains some exemptions, like on-premises signs, and the ACLU of Alaska argues that it’s being unfairly applied to political speech. The lawsuit is far from being decided, but if successful the ACLU and Dunleavy for Alaska would likely render the entirety of the billboard ban unconstitutional, opening the doors for billboards along Alaska’s state roadways. The state also worries that overturning the law would endanger as much as $50 million in annual highway funds made available by the Federal Highway Beautification Act. After cheering the win on Twitter, the ACLU of Alaska spent most of the afternoon defending the lawsuit. It contended that contends that it’s not the objective of the lawsuit to overturn the law even though it does argue that the law should be found unconstitutional. Ah, yes, the Legislature, which hasn’t been known for being particularly punctual or on-task in recent years. Be the first to comment on "Court gives OK for “small” 4-by-8-foot political signs along state roads"